Levelling Staff | Procedure of Taking Staff Reading. Hey, do you want to know more about Levelling Staff and How to take staff reading? (Shhh) I know you want. Leveling Staff is an instrument used to determine the difference in height between two points. Levelling Staff is known as the staff rod, Levelling rod, and self-reading staff, as the staff readings may be taken directly by the instrument man from the levelling instrument. The new levelling staff (in the metric system) is 4 meter long and made into two pieces of 2 meter length each. This is light, more convenient to handle and facilitates taking readings with greater accuracy than the telescopic type. 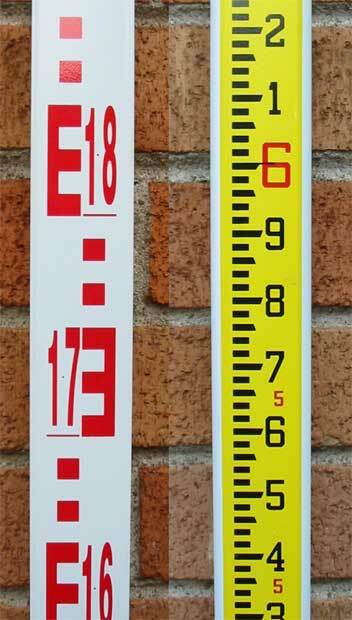 The width and thickness of the Level staff are 75 mm and 18 mm respectively. The staff is made of well-seasoned cypress, blue pine or deodar wood free from defects such as knots, cracks, shakes, insect attacks, etc. Levelling staff is also available in aluminum. Regarding quality, Aluminum staff is considered the best and accurate one. A folding joint is provided to connect the two pieces together with a locking device at the back. (3) and when the two pieces are locked together, the staff is quite rigid at the joint and perfectly straight. Read Also: What is Levelling? | Important Terms in Surveying and Levelling. Brass caps are provided at the bottom and the top of the staff. A cast iron ground plate is supplied with the staff, which may be used as a ground plate. The ground plate has a semi-circular hole at the center such that the same may be fixed to the bottom of the staff with a brass pin. A circular bubble of 25 minutes sensitivity is fitted at the back of the staff to facilitate holding the staff vertically. The bubble is 12 mm in diameter, 6 mm in height, suitably cased and fixed with rust proof brass screws at a convenient height. Necessary fittings are provided for a plummet to test and correct the back bubble. The total weight of the staff including all the fittings is not more than 6.5 kg. Each meter is divided into 200 divisions of 5 mm each. The graduations give the distances exactly from the bottom brass cap of each length and are continuous from one length to the other. The whole number of meters are marked on the right side with red figures of 35 mm height. The bottom of each graduation is at a distance of 5 mm from the preceding whole number of meters. 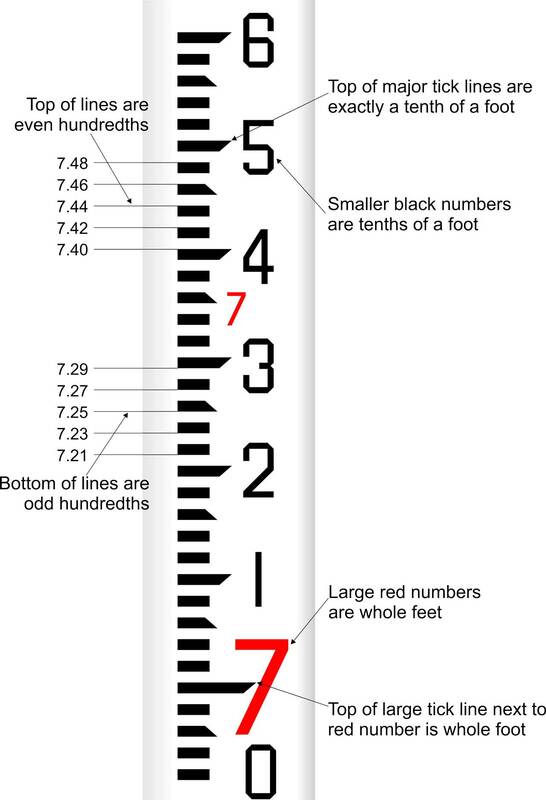 The bottom of “0” meter graduation is 5 mm from the bottom of the staff, and the bottom of “1” meter graduation is at a distance of 5 mm after 1 meter is completely over. The figures Indicating each decimeter are marked on the left side with black figures. There is a red mark of 70 mm width and 5 mm thickness at each decimeter. The corresponding decimeter is complete at the top of the red mark, and from there the next decimeter starts. Each decimeter length is divided into 20 parts by alternate black and white spaces each of 5 mm thickness. Thus the least count or the smallest division that can be read is 5 mm. The graduations on the staff are marked to an accuracy of +- 1 mm. (1) The instrument is set up and carefully leveled. (2) The staff is held vertically over the staff station. To hold the staff vertically, the staff man stands behind the levelling staff with his heels together and the bottom of the staff in between his toes. ….and holds the staff in between the palms at the height of his face. The staff is moved till the bubble at the back is at the center. (3) The telescope is directed towards the staff by the instrument man, and it is focused by using the focusing screw. The telescope is moved till the staff is exactly between the vertical hairs of the diaphragm. (4) If the bubble on the telescope is not at the center, the same is centered by using the foot screws. The readings may now be taken. The staff reading is the reading on the staff at which the horizontal hair appears to cut the staff. A staff reading consists of 4 digits. The first digit represents the whole number of meters, the second digit represents decimeters, and the third, and fourth digits represent millimeters. Thus if we say that a staff reading is 2.175, it means up to the division at which the horizontal cross-hair appear to cut the staff, 2 meters, 1 decimeter, and 75 mm have passed. …(75 mm means 15 spaces on the staff). When the staff is seen through the telescope, it appears inverted. Therefore, the staff when held on the ground should be read from above downwards (and not from below upwards). Theodolite Parts and Functions [A Detailed Guide]. Thanks for the sharing information about staff reading. I really learnt a lot within a very limited time period. many thanks.